The Harmony Stowaway Beach Cart stows conveniently in your boat. 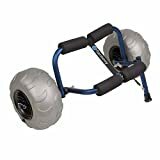 It uses soft-pneumatic tires and a compact frame, making it easy to break down and stow handily in the hull of your boat. Soft tires accommodate soft sand and muddy trails well, a welcomed benefit if your route has a number of portages interspersed with lake and river. Features a blue anodized coated aluminum frame with kickstand for easy mounting. The Stowaway beach cart is designed to be mounted under the center of the boat it is carrying, and includes buckled straps to help secure the boat to the cart while rolling.